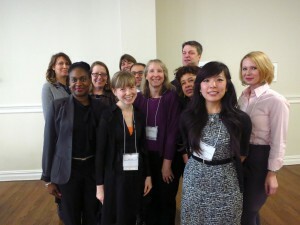 Front row (left to right): Dianne Gordon Conyers, Julia Furay, Trudi Jacobson, Barbara Bonous-Smit, Silvia Lu, and Nicole Brown Back row (left to right): Natalia Tomlin, Linda Miles, Megan Wacha, Robert Farrell and Ian Beilin. A�ACRL/NY collaborated with LILAC (Library Information Literacy Advisory Committee) (CUNY) and Barnard College Library on the program Librarians on the Threshold: An Overview and Panel Discussion of ACRL’s Framework for Information Literacy for Higher Education (full program).A�A record number attended the program that was held on October 31, 2014 at Barnard College James Room. Keynote speaker, Trudi Jacobson. co-chair (with Craig Gibson) of the ACRL Information Literacy Competency Standards for Higher Education Task Force is also Head of the Information Literacy Department at the University at Albany Libraries. In Trudi Jacobson’s presentation, A�ACRL’s Framework for Information Literacy for Higher Education, Trudi addressed student research behavior, the goals, major elements and implications of the ACRL information literacy framework and threshold concepts. From research studies such as Alison Heada��s a�?Project Information Literacy: What Can Be Learned about the Information-Seeking Behavior of Todaya��s College Students?a�? (Proceedings of the ACRL National Conference (2013), Indianapolis), Trudi noted that studentsa�� research skills are usually very poor. Students are often intimidated by the academic research assignments and confused by the research process. They tend to use a�?tried and truea�? resources and tools such as Google and Wikipedia are frequently used by them along with a few databases. Accordingly, they miss seeing the a�?Big Picture,a�? and often lack information gathering skills, a�?understanding the meaning of wordsa�? or language, and a�?knowing the expectations of assignment.a�? These deficiencies prevent them from becoming a�?information literate.a�? The main focus of Trudia��s presentation was on the new framework and threshold concepts. The audience learned of the potential for this new framework including its goals and challenges.A� Trudi emphasized that threshold concepts for information literacy are based on the works of Jan Meyer and Ray Land. She also emphasized the works by L. Townsend, A. R. Hofer, S. Lu, K. Brunetti, and Silvia Lu. There are many implications for the new Framework for Information Literacy for Higher Education, one being, increased collaboration between librarians and course instructors. Research skills instruction and tools will be well-defined and information literacy will be a�?sustained or integrated learning experiences.a�? Trudi suggested that these frames could be placed on any level and librarians will become more involved with pedagogy.A� Formative assessment will take place to evaluate and determine any gaps in learning along with revision of the curriculum. The event concluded with an excellent Panel Discussion co-moderated by Robert Farrell (Lehman College, CUNY) and Julia Furay (Kingsborough Community College, CUNY). Nicole Brown, Multidisciplinary Instruction Librarian, New York University Library presented TheA�Framework as Program Development Tool.A�She used the Framework drafts as a protocol for scholarly discussions or conversations and interactions with faculty at NYU. For example, she held a wine and cheese reception or research discussion with directors of the writing program, pedagogical directors and mentors. Silvia Lu (Reference and Social Media Librarian and Assistant Professor at LaGuardia Community College, CUNY) provided a refreshing look at Threshold Concepts in Practice.A�The audience got a glimpse of how she used the threshold concepts in her information literacy classes. For more on Silviaa��s ongoing work and presentations, please see: http://www.ilthresholdconcepts.com. Beyond the Threshold Conformity, Resistance and the ACRL Information Literacy Framework for Higher EducationA�was the thought provoking presentation by Ian Beilin (Assistant Professor, New York City College of Technology Library, CUNY). The program opened with welcome greetings by Barbara Bonous-Smit (ACRL/NY Professional Development Committee, Chair); Curtis Kendrick (University Dean for Libraries and Information Resources, CUNY); Robert Farrell and Julia Furay (Co-Convenors, LILAC (CUNY); and Lisa Norberg, (Dean of the Barnard Library and Academic Information Services). Many thanks to Megan Wacha (Research and Instruction Librarian for the Performing Arts) of Barnard College Library for her help in coordinating the event, including providing a beautiful space for the event.A� Thanks also to the other coordinators for making the program a great success: Robert Farrell and Julia Furay and the members of ACRL/NY Professional Development Committee: A�Dianne Gordon Conyers (LaGuardia Community College Library, CUNY); Natalia Tomlin (Long Island University C. W. Post); and Natalka Sawchuk (Iona College Libraries). Additional thanks to Sheila Beck (Queensborough Community College Library, CUNY) for helping with sign-in.